In order to book a session, visit the Contact Tab on my site's menu bar! On this tab you can submit a Contact Form. From here, I can send you all of the necessary information you'll need! If you decide to move forward, a signed contract and a 50% non-refundable retainer fee is due in order to be considered "booked." How far in advance should I reach out about my wedding day or engagement session? I currently book portrait sessions about two months in advance. I book wedding days anywhere from 6 months to a year and a half in advance. I am currently booking 2019-2020 wedding dates. Will you help us with posing and clothing ideas at the engagement session? Totalllly! 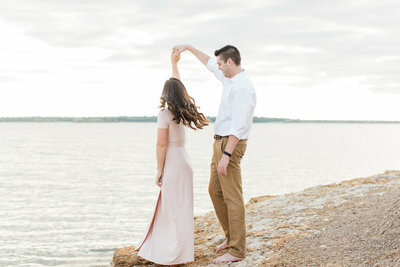 I try to take a more natural approach to posing and will help with clothing recommendations so that you have the best engagement session possible! I'll also send a detailed clothing style guide prior to the session in order to help ease the process of outfit selection. No worries, I'm here to help! My fiance and I have a budget range in mind...how do we know if you can work with our budget? Shoot me an email and let me know what you're looking for in a wedding package, and what your budget is! From there, we can work together to build a custom package that suits you and your wedding day needs. Have other questions for me? Feel free to shoot me an email (click here) and I'll reply asap!